Dubai: Dr. Ashraf Sobhy, Egypt’s Youth and Sports Minister, is backing his government to put plans in place to use football star Mohammad Salah’s overwhelming popularity to inspire the next generation of sportspersons in the country. Sobhy, who occupies the post following the resignation of Khalid Abdul Aziz in June this year, insisted that the Egyptian Government is convinced on the need of riding the “Mo Salah factor” while laying down a blueprint that includes the establishment of academies, clubs and sports bodies all over the country in the future. “We have one Mo Salah now, but in the future we can have a thousand Mo Salahs coming through the specialised football academies and clubs,” Sobhy said at the opening session of the 14th Dubai International Sports Creativity Symposium held at the Mina Al Salam Hotel on Wednesday. “Mo Salah is a huge brand today and we will use this brand for the betterment of Egyptian football and sports in general. His success is a beacon and a blueprint that we can implement at both the macro and micro level for generations to come,” he added. 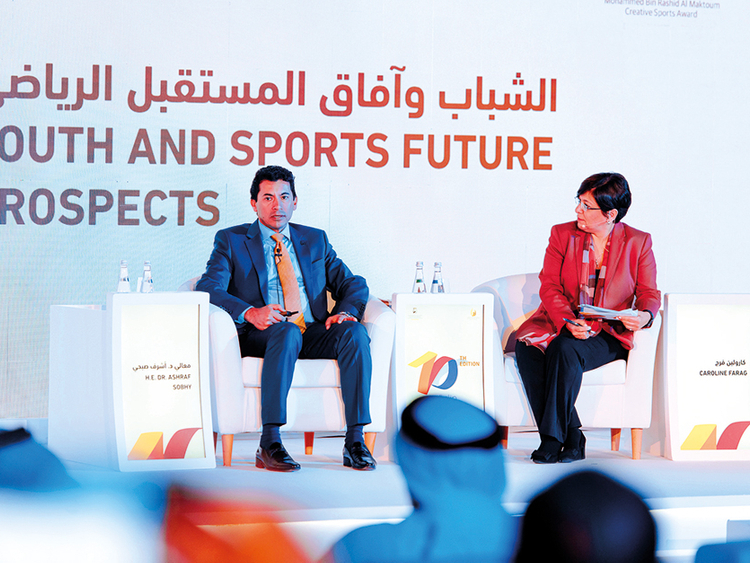 Organised by the Mohammad Bin Rashid Al Maktoum Creative Sports Award, which is one of the Mohammad Bin Rashid Al Maktoum Global Initiatives, the 14th Dubai International Sports Creativity Symposium was held under the theme “Empowerment of Youth in Sports”. The annual symposium was opened by Mattar Al Tayer, Vice-Chairman of Dubai Sports Council (DSC) and Chairman of the Mohammad Bin Rashid Al Maktoum Creative Sports Awards’ Board of Trustees, along with Saeed Hareb, General Secretary of DSC, Moza Al Merri, Board Member of DSC and General Secretary of the Awards, and Nasser Aman Al Rahma, Assistant General Secretary of DSC. Another Egyptian featuring at the symposium was modern pentathlete Aya Medani, who has the distinction of representing her country at three successive Olympic Games between 2004 and 2012. “Salah’s success has opened doors not just for Egyptian footballers, but for players from across the Arab world. It is here that we have a great opportunity to build on this success. We have set plans in motion that will, hopefully, create many more Mo Salahs in this part of the world,” the 29-year-old hoped. Salah’s move from Roma to Liverpool bore instant rewards as the Egyptian made it to the three-man shortlist for the 2018 Best Fifa Men’s Player award. He eventually finished third behind Croatian Luka Modric and Cristiano Ronaldo of Portugal. “Salah made it to the top three in the Fifa awards, so that puts him at a different level. He can be a true inspiration for a number of young players, who have the talent and the hunger. They are just waiting for their chance,” Sobhy said. What was that hand gesture by Virat Kohli about? Is Dhoni without a major bat sponsor?